* First day : we greet you at either the Buon Ma Thuot airport or bus station to your hotel. *Second day : After breakfast at 8h, we go to Buon Don tourist center, here, was famous for the traditional wild elephants catching and elephant taming . You can know the way how to catch and taming wild elephants of M'nong ethnic people . 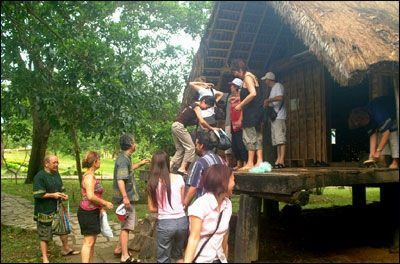 Walk across the bamboo suspension bridge over Serepok river, visit an ancient wooden house on stilts with Laotian architecture. And then transfer to the waterfalls, take a walk along the Serepok river to enjoy the majestic greatness of waterfalls , Draynur,Draysap . *Third day : After breakfast at 8 a m check - out and go to visit Akothon (Ako Dhong) village (the village of Ede minority people), ethnological museum, Trung Nguyen coffee village , coffee restaurant of MeHyCo to try famous coffee of Buon Ma Thuot. If you are interested in special coffee, you can try and see them eating the best ripe coffee berries to make special coffee called weasel coffee (coffee season in november). We then go to beautiful Lak Lake, on our way we stop somewhere to see rubber, coffee, plantations, pepper trees, taking some pictures from a beautiful situation overlooking the rice field valley, ..climb a big rock, grannite stone as a short exercise session , local people said :‘any person who reaches the top of the rock will be happy and never getting old’ . Bao Dai Emperor’s house (The Last Emperor of The Dynasty of Nguyen), visit Jun village (the village of M’Nong minority people) share the simple ways of living in many long houses of the village.. row a piragua on Lak Lake to see natural lotus flowers get to M’Lieng village lying along Lak Lake, elephant riding, a great experience. It is very interesting, elephants paddle across the lake , they are intelligent to use their trunk to measure the depth of water how to not get wet tourists on their backs..